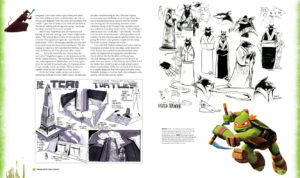 Teenage Mutant Ninja Turtles: The Ultimate Visual History by Andrew Farago should please all Turtles fans. The hardcover book doesn’t disappoint with big, clear sketches, drawings, animation cels, photos, etc. At almost 190 pages, Ultimate is almost a museum on the printed page. Farago puts together an impressive package; even the text shows enthusiasm for the subject and appreciation for their creators and stewards. Other than my nitpicks of spotting a typo (LGN, not LJN), that the removable items (excepting the excellent reprint of the first comic and big poster in the back pouch) are really hard to remove without injuring the pages and that Vanilla Ice is treated with a bit too much reverence, I really enjoyed the book. Now, a decades-old origin story. Two men came up with a wild, inspired idea that would grow into a comic book sensation. That last sentence could also describe Siegel and Shuster, or even Kirby and Lee. Where Superman’s creators had a decades-long fight for recognition and the Marvel universe’s artistic king left a relative pauper, the Turtles’ founding dudes became successful and rich. Then the RPG sourcebooks arrived. Then the toys. Then the cartoon and movies. Eastman and Laird may not have looked at pizzas or sewers the same way again. 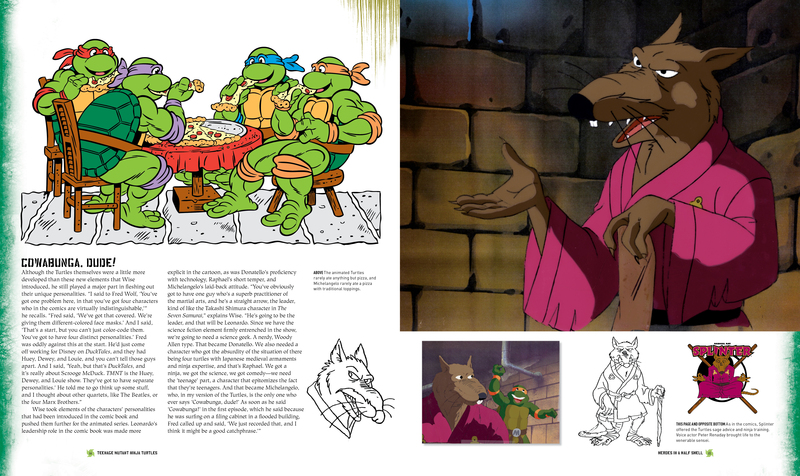 See also: An interview with Kevin Eastman. 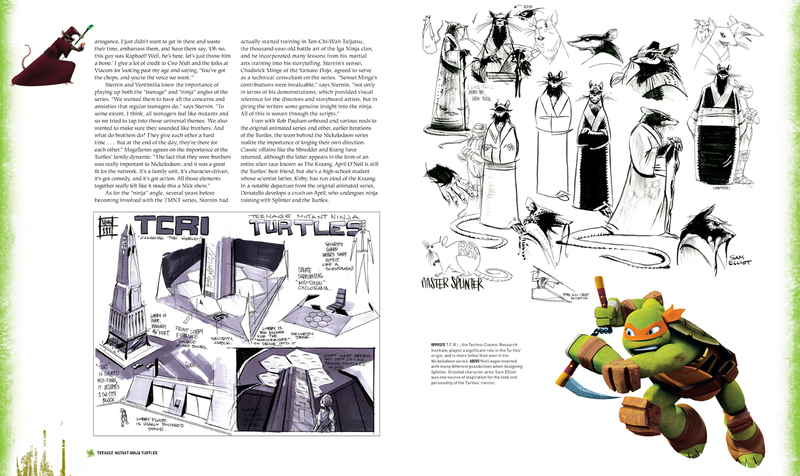 Farago tracks the development, peaks, and valleys of the Ninja Turtles every step of the way. The upcoming “Definitive History” documentary, Turtle Power (formerly Chasing Turtles), may have a hard act to follow. 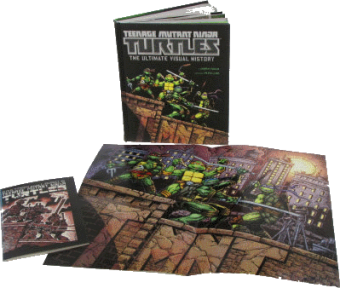 “Teenage Mutant Ninja Turtles” is a household name today, but the title was so audacious it got Eastman and Laird serious attention from the comic book world to the mainstream media. 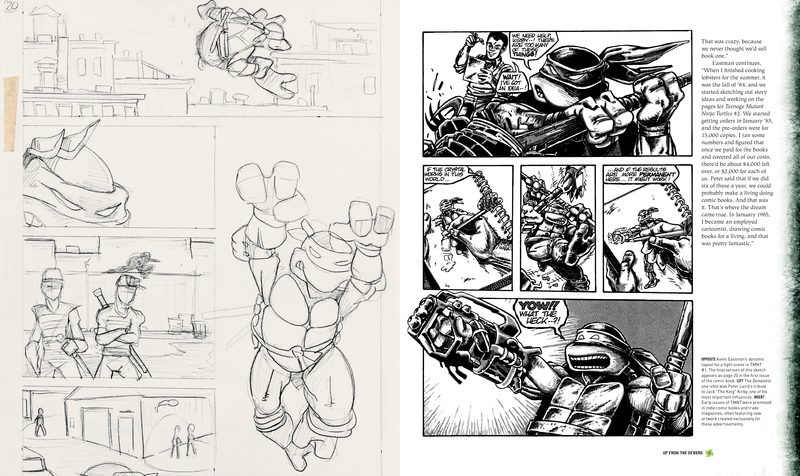 Ten years after the first printing of the original Frank Miller-inspired comic, TMNT had been a huge phenomenon, but at the cost of rising tensions between the two creators. Laird bought Eastman’s share in 2000. 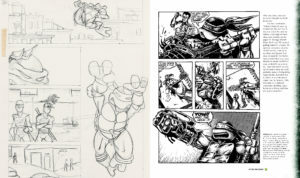 For almost a decade, Turtle-related projects had the approval of Laird alone, who didn’t want another silly take on the Turtles’ lives and adventures. Having had enough of managing a mega-franchise, Laird sold TMNT to Nickelodeon, who relaunched a new animated series balancing the gritty with the fatuous. The text of Ultimate is full of quotes from the two creators, Fred Wolf, Stan Sakai (check out benefit auction for him and his wife, Sharon), Brian Henson, Nickelodeon’s Ciro Nieli, and many talented others. While the book provides many thoughtful reminisces, I’ll share mine. My first experience with the Ninja Turtles were the Playmates commercials. The toys looked very cool — and I was a GoBots/Transformers-loving kid — and the jingle, cheesy as it is, stuck with me. From what I recall, the original cartoon from Fred Wolf & Murikami-Wolf-Swenson originally came on at a very early hour (6-something, 7-something, I forget). That mean my parents forbade me from watching it before school. Eventually, I watched it all the kids did. Ninja Turtles came on in the afternoon and I watched it as much as I could. Even when CBS put the show on Saturday mornings and USA would air repeats, I just couldn’t get enough. The 1987 series is possibly the last popular cartoon in the “Toyetic” era of TV animation. You know, those times when just seeing our cartoon heroes and buying the merchandise sent us into ecstasy. Pushing the envelope of storytelling and animation style that would come in the 90s renaissance? We spat on that while we gobbled up the latest HappyKidsFun Meal from FastFoodCo. Who cared if Mr. Laird, co-father of our heroic reptiles, was far from enamored with the silliness that wasn’t his and Mr. Eastman’s vision? Let’s enjoy that funny fly-man pester hottie April who wears that yellow jumpsuit so well. My big deal with the Green Team weren’t the toys and merch, of which I owned very little. 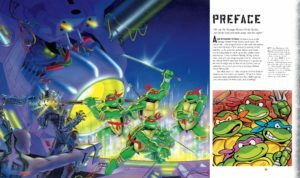 The peak of everything Ninja Turtles was the series of video games put out by Konami, especially both arcade games and all the games on Nintendo home consoles. Turtles in Time was the greatest arcade beat-em-up ever and Konami’s SNES port was equally joyous. That said, Ultimate’s video game coverage lacks depth. Oh, well. A book that has to cover the various comics, cartoons, and toys isn’t the best format for that. As it’s a visual history book, there’s no solid narrative. I could think of one thread: how two guys from the Northeast became really successful at comics and beyond when the great King Kirby didn’t. But that would be more appropriate for a comics-centered thesis paper. To be fair, Farago does acknowledge Eastman and Laird’s many accomplishments in the comic book world. How much of a Ninja Turtles fan was I? I saw the movies. Even the second one where Vanilla Ice danced his way into the hearts of America’s children. I even dug the Coming Out of Their Shells Tour VHS tape. I saw every episode of the original series, even the final “red sky” seasons. I even tolerated Venus, the female fifth turtle from the Next Mutation; otherwise, that series was unremarkable. Fans of the original cartoon should really continue reading the book in the eras after You Stopped Liking the Ninja Turtles Because They Were Just a Fad (YSKNTBTWJF, or “yuh-sul-nit-bit-twizh-eff”). Check out the drastic, arguably gimmicky, changes done in the late 90s Image comic books. Maybe you’ll gain an appreciation for the 4Kids animated series like I did. 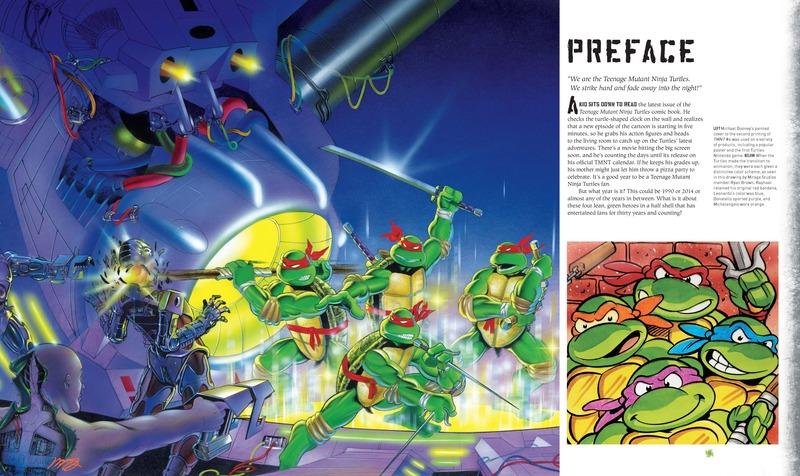 Ultimate features coverage, by plenty of images and text, of the 4Kids series and the Turtles Forever “swan song,” the Nickelodeon series, and the Michael Bay-produced movie. Oh, there’s also plenty of artwork and chatter from the latest IDW comics, the adventure books too few care about anymore. My fond memories were triggered thanks to one man, one book, and two awesome men. As my respect for Eastman and Laird grew over the years, I feel a little guilty for really enjoying the goofy original series then skipping over the 4Kids show. Owners of the Ultimate Visual History should have the ultimate nostalgic memento. Thanks to publisher Insight Editions for providing a copy for review and the preview pages above. lol @ “Vanilla Ice is treated with a bit too much reverence”. That’s a sentence I never thought I’d hear. Ha, I know I’ll get a little flak for that. That may the most subjective thing I said, but you’ll really like the royal treatment Vanilla Ice gets.